If you are a veteran of the U.S. military and have a current injury or condition that is connected to that service, you may be eligible for veterans’ disability compensation. While the VA is responsible for assisting with the gathering the information that is relevant to your claim, the only way to make sure that the VA has all of the information related to your service and disabilities is to submit the records yourself, or with the assistance of your Veteran’s Service Officer (VSO). The steps for requesting your service treatment records (STRs) and personnel records are explained below to help guide you through the process. How Do I Get My Service Treatment Records and Personnel Records? If you are the veteran or next-of-kin (widow/widower (un-remarried); son or daughter; or father, mother, brother, or sister of a deceased veteran), you can submit a request for military personnel, health, and medical records online through the National Personnel Records Center, Military Personnel Records (NPRC-MPR) at www.vetrecs.archives.gov. Your authorized representative, including a VSO, may also submit requests for these records on your behalf, with a signed and dated authorization (i.e., a Power of Attorney or POA). What Information Do I Need to Request My Service Records? You may also need the veteran’s place of discharge, last assigned unit, and place of entry into service. If you are not a computer person, the request for your records can also be made by mail, using Standard Form 180. This form can be obtained online or from your local Veterans Administration office or veterans service organization. It requires the same information as the online request. Upon completion of the Standard Form 180, mail it to the appropriate address listed on the 2nd page of the form. After approximately 10 days, you or your VSO can check the status of your request through the Online Status Update Request form or by calling the Customer Service Line at 1-866-272-6272. What If Some of My Service Records Are Missing? Once the service records are received, it is important to review them with your VSO since it is not uncommon for the records to be incomplete. After review, if you determine that there are missing records, you can contact the Records Center or VA and make another request. When making this new request, make sure to provide more specific information about your location, dates, etc. If you are still unable to locate the records, you may be able to fill in gaps in your service history with statements from an officer or a buddy who served with you, or other medical records that can draw a connection between your service and your current disability. 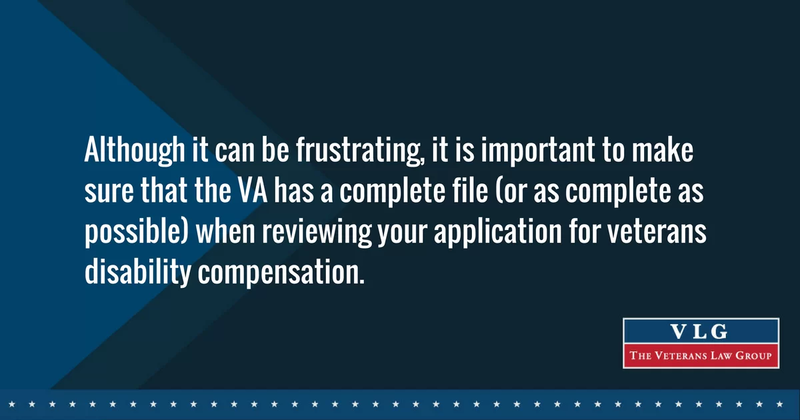 Although it can be frustrating, it is important to make sure that the VA has a complete file (or as complete as possible) when reviewing your application for veterans disability compensation. Taking these additional, proactive steps to get your records will save you time and heartache down the road.